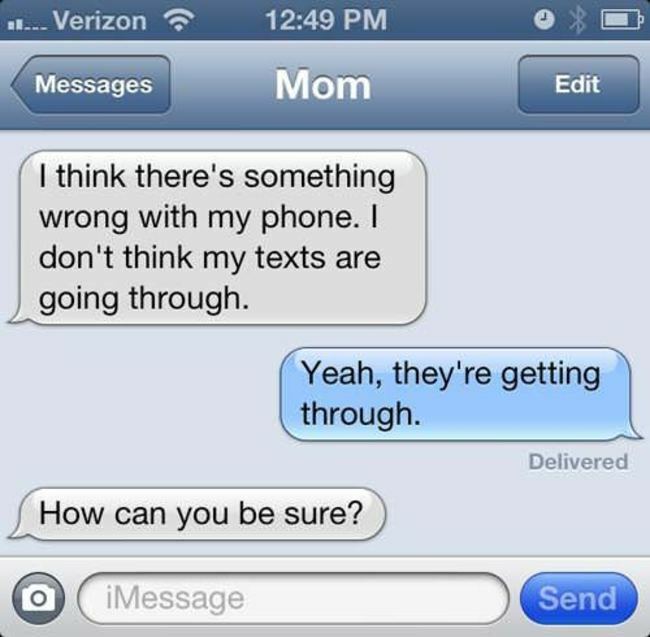 Do your parents have a smartphone? How about grandma or grandpa? There are 122 comments already... Come join us! Not hard to do when you—well—livein Italy. I laughed so hard, I went into an asthma attack!! Really? There is money in writing this BS? Not jokes. 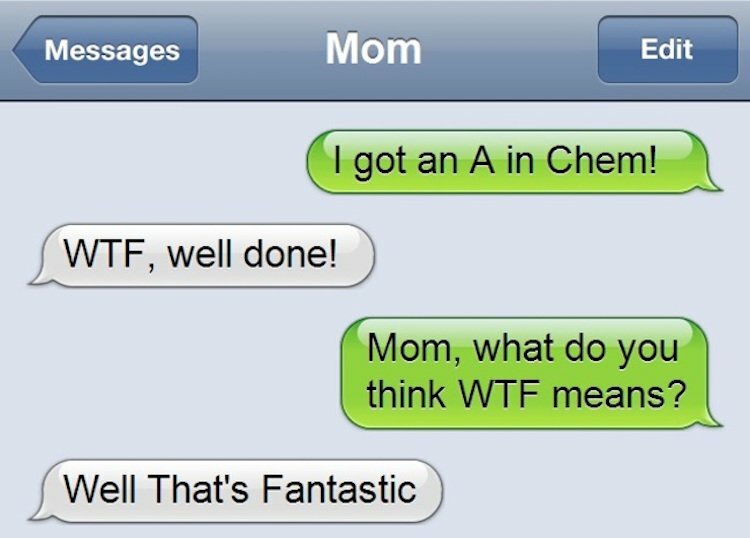 My Mum used to write her texts without any punctuation until she found out where the full stop was! Now I can breathe when reading her texts. I literally laughed out loud, until tears streamed down my face. I could imagine reading her texts before she found punctuation, would’ve been about like trying to read the title of the famous song, “Supercalifragilisticexpialidocious” – from Mary Poppins. Just because we haven’t learned something doesn’t make us stupid. Seriously. I agree, Maggie, a foolish statement. Agreed! “Stupid” is unintelligent, as in CALLING people stupid when they have not been educated in a certain subject or task. Hmmmm……hopefully Angelique could become “less stupid” with age. Some of the most “educated” people I know say the most stupid things of all. Great article! Where did you come up with the idea? hilarious! Have experienced most of them with my folks!! Reminds me of my mom!! She still doesn’t understand how to “download” pictures from “the Firefox” onto her phone, or that she can’t install all her PC games on her tablet. She doesn’t have Angry Birds, Cut the Rope or any other typical smartphone games but she has eight different Solitaire games!! LOL So true. I can’t imagine how all of us growing up on this stuff will be when WE’RE this old! LOL! 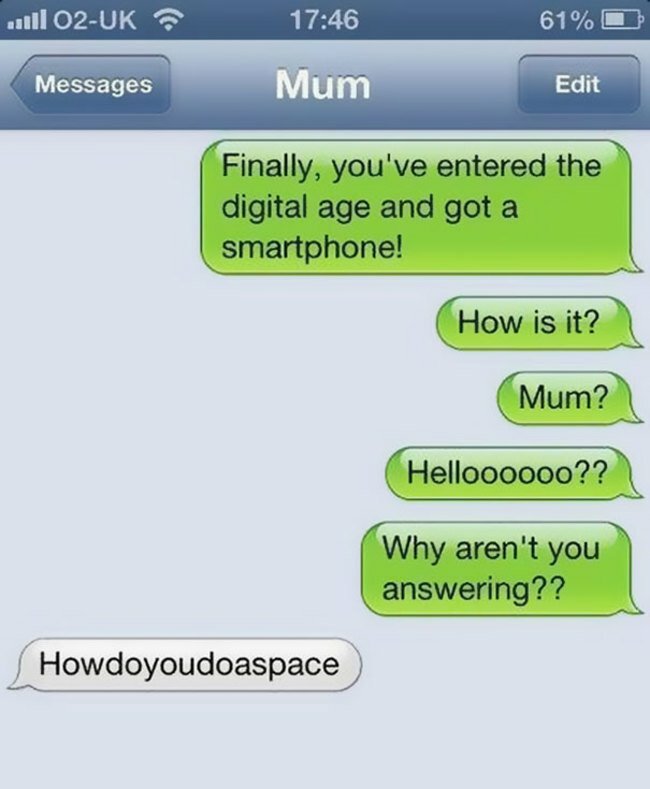 ITS CALLED WEBSITE, MUM !! Oh. Yeah. Well, I think the parents do well by just turning them on. Now if we used them from childhood you would have professionals on your hands. That’s my story and (as a parent) I’m sticking to it. Relate so well to this! I am going to be honest for I am one of those Moms! Too funny. Reminds me when fax machines first came out. I was showing my employee how to use it and she said to put a note on the letter that we needed it back because it was the only copy we had! Ah good times!! We are not stupid. .we just didn’t grow up with this stuff like u kids did..
I’m Buying you a house. .
To see if their reading them. .
Stupid? No way! This technology is built on generations of technological geniuses! Hahaha! 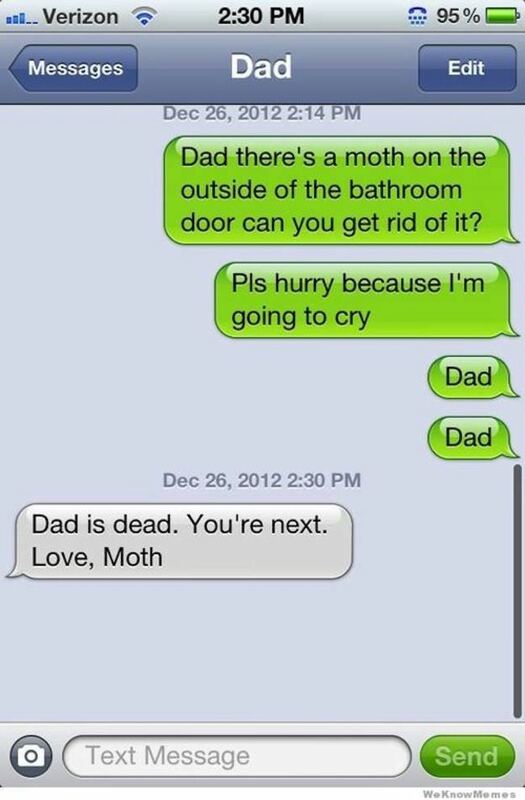 “Dad is dead, your next, love moth” I love that one!! Yeah well done. 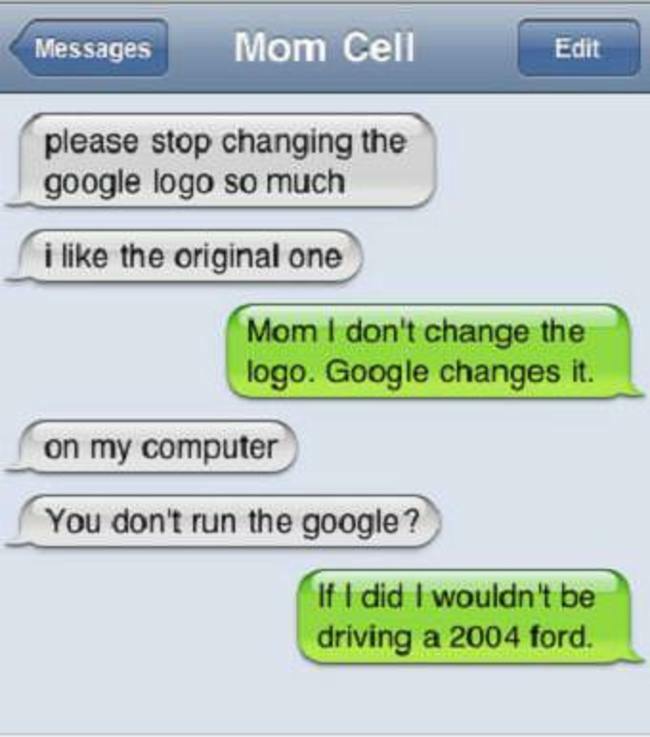 Another post on ‘let’s laugh at the old people because they’re not very good at technology’. How very ageist. 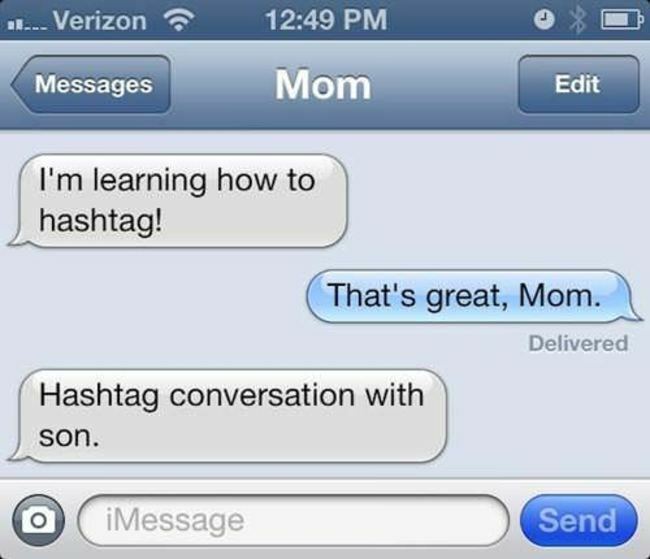 I know lots of olds who not only can text, they can program too – better than you no doubt. 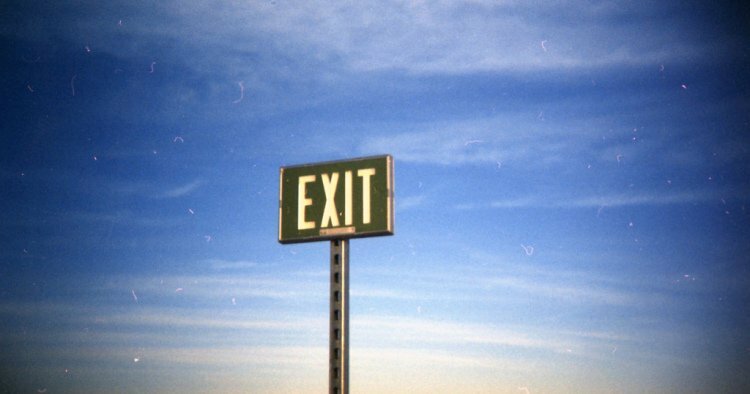 Very very clever blog. Thank you for the laughter! Thank for very funny sharing. Accept it for what it is, a bit of fun. There’s little enough to laugh at in this world. Thanks for that good laugh! I think it is so close to home! That one cant help but laugh! It’s a jouney in life! And we all on the same jouney. And its health to have a good llaugh. Keep on doing it! This is for real, when I got my first mobile i went out to the garden trying to get the dialling code. I ended up calling my son on the house phone. He couldn’t speak to me for laughing……. I relate to these so well, my mom is 73 and drives me crazy with her Facebook page, but I love it that she is staying up to date with the grandkids. I myself am an idiot when it comes to technology, I phone my husband to help me to “fix” the new phone. To change the ring tone and that does NOT make me stupid, I am friggin great at other things but simply don’t have the need or desire to figure this out. There are things we can do that our kids don’t know – like work the darn dishwasher! Excellent piece, you made my morning! I Laughed so hard I literally had tears running down my cheeks! Even clicked on the your link for more!! I thought they were hilarious, as I’m home in bed with the flu. Who cares if they are made up or not? We all have stories! When my husband and I finally got a smart phone he would try this texting thing out. My youngest posted on Facebook (which Dad is not on but I am) “it’s so cute, my Dad just started texting, and he signs all his texts ‘from Dad'”! I’m an OLDS and this was freaking great. Loved it! 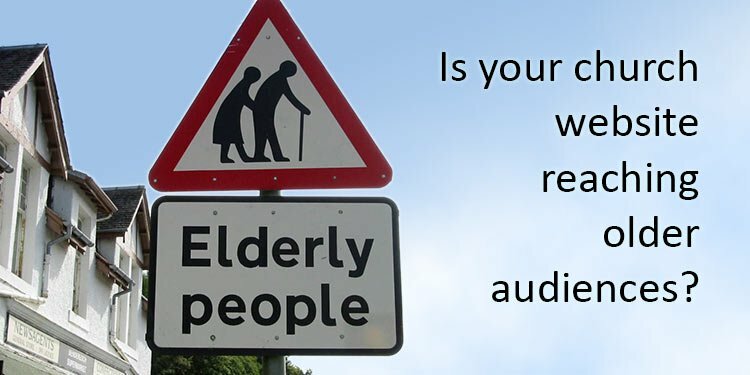 So close to home, but I must admit our “techie” in a church I served was 80 years old. He was great! What happened to the comment I made earlier? 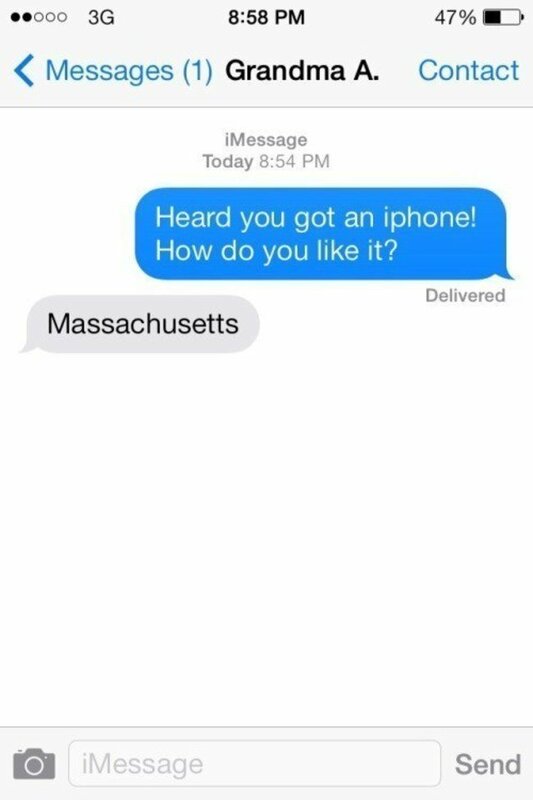 Love a good laugh – now – someone has to explain to me the last message about “Massachusetts” I figure it was a spell check thing, but what was the reply supposed to be? See – the challenges continue, even as we laugh! Happy we’re in the same boat. I didn’t understand the Massachusetts post, either. i make up my own things like lol, rotfl. (Forgot what you call those, lol! Anyway, it makes my daughter (age 25) crazy! She says, mom, you can’t do that! i say, watch me! She says, mom, no one understands those you make up! Well that’s what she gets for making fun of her mother! Lol! Thanks for sharing these! I’m in my mid-forties and just got my first smartphone a couple of months ago. I may not be as bad as some of these examples but I’m definitely technologically-challenged, and I have no problem with laughing at myself for not understanding. Have a great day!!! very nice njoyed lot!!! u made my day!!! smart phones in the the hand of notsosmart people. My BF got his first Smart Phone last week, he returned it the next day siting Stupid Operator does not want to be be dumber than the phone. 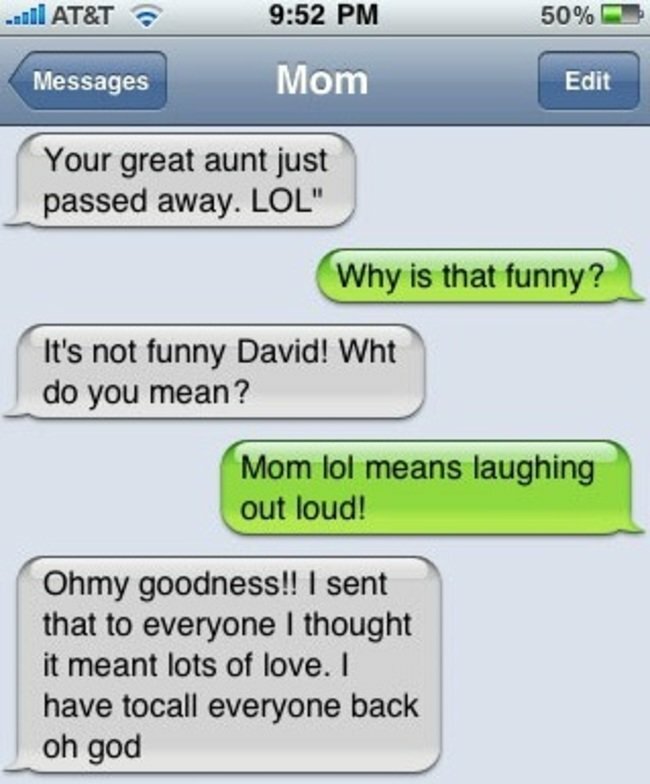 At first I also thought lol was lots of love. 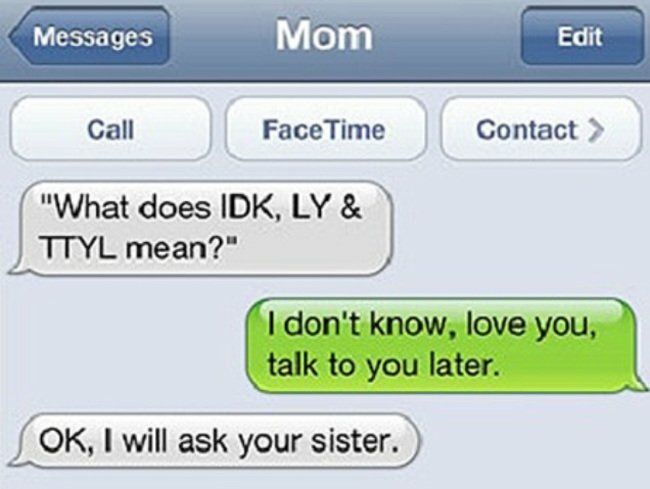 I am a grandmother who would rather use the phone, but must learn to text if I want to connect with the younger generation. I was lol at the above. Thank you. When a friend in her 60s first got a mobile phone I used to text her with the odd LOL. It wasn’t until quite some time later that I found out she thought I was calling her ‘little old lady’. I was gutted! I have worked in IT for over 30 years, everything is relative – my dad (aged 84) who uses Facebook a little but sends emails and does internet banking thinks I am a genius, my Support people think I am an idiot, and my friends ask me to come and fix their problems. I provide technical sales expertise for software but it took me quite a while to work out that LOL didn’t mean lots of love. is it not sad that laugh out loud has a shortform but lots of love does no. is there another similar greeting that would do the job? Jane commented that she “laughed so hard the tears ran down her cheeks.” I want her to know that at my age (82), the tears run down my legs. Great posts. Thanks for the fun read. Thanks Eric, great fun~ made my day , and it’s only 05.40 !!!! I thought I said 7 or eight minutes…..